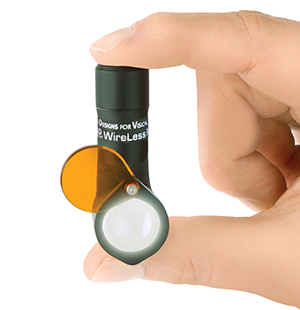 Introducing the LED DayLite® WireLess Mini HDi, a self-contained totally cord-free headlight now with HDi technology. Like our other LED DayLite WireLess models the WireLess Mini HDi integrates with various platforms including your existing loupes, safety eyewear and future purchases. 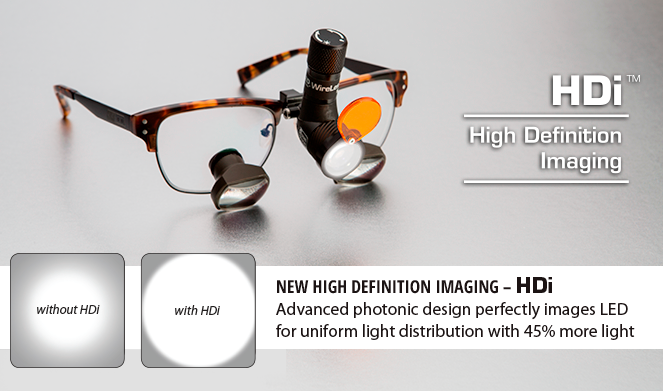 The NEW HDi technology optically focuses the LED for uniform light distribution with 45% more light. The spot size of the LED DayLite® WireLess Mini HDi will illuminate the entire oral cavity while providing 27,000 lux of neutral white light. A simple twist of the top cap turns the light on or off. The LED DayLite WireLess Mini HDi is powered by a single, rechargeable lithium-ion battery. Three batteries are included with the headlight along with a charging cradle that allows you to independently re-charge two batteries at the same time.